In the Summer of 1979, Robert invited Glenn to his studio in Battersea to jam. Robert on guitar and Glenn on an EDP Wasp synthesizer. For each session that summer they would play for about 40 minutes, maybe longer, stoned. Robert suggested they record it, many times erasing and over recording one session for the next. The music had no titles, as they were never intended to be released. On these recordings, Robert enjoyed playing like Robert Fripp of King Crimson, while Glenn channeled Wolfgang Flur of Kraftwerk. Influenced by Krautrock bands like Can, NEU!, Cluster/Harmonia, as well as Terry Riley and Brian Eno the duo forged a unqiue brand of Industrial music. Tape loops and synthesizer sounds played backward conjure dark ambient moods. All songs have been remastered for vinyl by George Horn at Fantasy Studios in Berkeley. The LP is housed in a jacket that features a drawing by Robert Rental from Glenn’s archives as well as a handwritten note from Robert to Glenn. Each copy includes 2 photo postcards featuring a transcription of Robert’s letter and liner notes from Glenn Wallis. 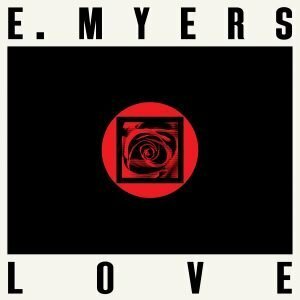 E Myers - Love/Hate 12"
Contemporary producer E. Myers has self released four limited edition white label 12”s since 2015, whilst managing to remain low profile. Whoever they are, we guess they’re huge fans of late 1980s Chicago House, Shep Pettibone, Colourbox and most of our reissues. So much that they asked us to re-release their second 12” ‘Hate / Love’ from 2016 backed with new remix of “Hate” made for Dark Entries. “Love” kicks off the A-side “beats out a wood-cut tattoo of tuff drums rubbed with balloon-squeak synths to sound like Gesloten Cirkel meets Helena Hauff,” said Boomkat. “Hate” is a dreamy house number that ultilzes a Roland TR-707 drum machine with a rounded bassline, horns and strings that lift it into the stratosphere. For the new remix of “Hate” Myers subtly shifts the pace and deepens the groove, stretching out the song to over 7 minutes of dubbed out New Beat phantasia. All songs have been remastered for vinyl by George Horn at Fantasy Studios in Berkeley. The 12” is housed in a die cut disco jacket that features an original design by Eloise Leigh. 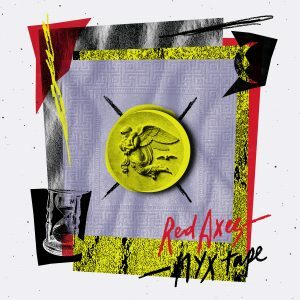 Dark Entries is honored to release a 4-track EP by Red Axes, the prolific production duo of Dori Sadovnik and Niv Arzi from Tel Aviv. The pair were raised on a diet of post-punk, new-wave, and Italo-disco at fogged out warehouse and basement parties. Their own productions and remixes have appeared on labels such as I’m a Cliché, Correspondant, and Hivern Discs. ‘Nyx Tape’ features two new compositions backed with two edits from our catalog. First up is the slick electro anthem “5 Min” another collaboration with French-Canadian born singer Chloé Raunet aka C.A.R. Followed by “Nyx Tape” featuring charismatic singer-lyricist Gina Kikoine aka Gina X, who reached out after hearing their remix of her classic single “No GDM” that was a huge anthem on the Tel Aviv 80s underground scene. The track is an ecstatic dance to the rhythm in the darkness with Gina’s ice cold Teutonic spoken word taking creative inspiration from the Jewish Mourners’ Prayer – The Kaddish. On the B-side “Destination Moon” by Solid Space from 1982 has been given a dancefloor makeover with moody synths and a haunting guitar line reminiscent of an Adrian Sherwood dub. Closing this EP is a hypnotic edit of “La Machine á Rêver” by French bedroom synth freaks X-Ray Pop from 1984 slowed down to a 4/4 groove that takes the original to outer space and back. All songs have been mastered for vinyl by George Horn at Fantasy Studios in Berkeley. The EP is housed in a custom made jacket that features an original collage by Eloise Leigh representing Nyx, the Greek goddess of the night. Each copy included a postcard with notes and lyrics. Dark Entries is honored to finally present the first ever official vinyl reissue of Space Museum by Solid Space. Solid Space was the British duo of Dan Goldstein (keyboards, vocals) and Matthew 'Maf' Vosburgh (guitar, bass, keyboards, vocals) formed in 1980. Dan and Matthew met at the age of 11 while attending school in north London. In late 1978 at at the age of 14, they formed Exhibit 'A' with Paul “Platypus” and Andrew “Lunchbox” Bynghall. They recorded two EPs in 1979 and 1980, self-released on Irrelevant Wombat Records and appeared on 'The Thing From The Crypt' compilation. After the dissolution of the group, Mathew started taking his guitar over to Dan’s house where he’d play his Casio MT-30 and they would record songs. Eventually a second hand drum machine and Wasp synthesizer were acquired from classified ads in Melody Maker and the Solid Space sound was born. By this time they were just turning 18 and finally found the freedom to make the music they’d had in their heads. Over the course of the next two years the band assembled eleven bedroom recordings that would become one of the most cherished DIY obscurities of its kind. Their debut album ‘Space Museum’ was released in 1982 on cassette by In Phaze Records. All of the songs were mixed by label boss Pat Bermingham on 8-track tape at The Shed, in Ilford, which was literally a garden shed. The band's music and lyrics were heavily indebted to science fiction, in particular the 1960s television series Doctor Who. 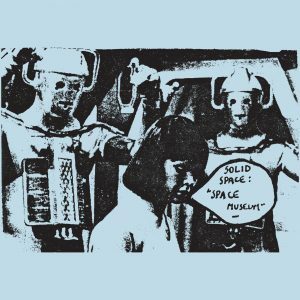 ‘Space Museum’ is an unveiling of atmospheric, minimalist post punk supported by bright melodies. The music combines drum machines and synths with acoustic guitar and toy drums whilst also experimenting with samples between tracks. Lyrics deal with space travel and a general sense of dejection. Representing a bubbling spirit within the underground, they foreshadowed an entire world of independent music which would emerge across the 80’s and well into the 90’s. For this reissue we’ve included two bonus tracks from the band’s archive, “Platform 6” originally released on the B-side of the second single by Exhibit ‘A’, this song features only Dan and Matthew and is the first Solid Space track ever recorded. “Tutti Lo Sanno” is a cover of In Phaze label mates Marine Girls, though the lyrics have been changed to suit the gender of the new singer. Each song has been carefully remastered for vinyl by George Horn at Fantasy Studios in Berkeley. The record is sleeved in a replica of the cassette artwork featuring the Cybermen and Jamie from the Doctor Who episode "The Wheel in Space". Every copy includes a double sided 11x11 insert with lyrics, notes and never before seen photographs of the band taken by Maf as well as a postcard featuring an original advert for the cassette. In early 1982 they set out to record their first album joined by Jean Michel Matuszak (keyboards) and Pascal Tison (bass). Soon after that they sent out a demo tape and the Amiens-based record company Stechak offered them a deal. The mini-LP "Le Repos des Enfants Heureux" was released in January 1983. It was received well by both the public and the media, especially outside of France. Originally featuring 5 compositions, we’ve added 4 demos never before released on vinyl. All compositions, lyrics and music were made collectively from shared experiences bonding over travels, literature and cinema. All songs have been remastered for vinyl by George Horn at Fantasy Studios in Berkeley. The LP is housed in a replica of the original jacket featuring a black and white collage by Nadia Zibirskaïa and each copy includes a photo postcard featuring lyrics and notes. After the success of the debut mini-LP the band returned to the studio and spent October 1983 to March 1984 recording their sophomore album. ‘Passions divisées’ was released by Stechak Products in October 1984. Pascal Tison was replaced by Laurent Dagnicourt on bass guitar. 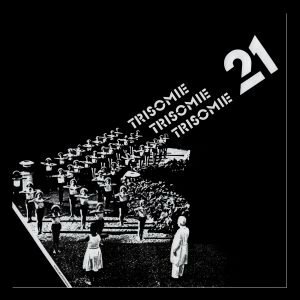 Featuring eight cold wave compositions including the instrumental funeral waltz “La fête triste”. Songs cross genres, moving from post-punk to synthetic electronics. All songs have been remastered for vinyl by George Horn at Fantasy Studios in Berkeley. The LP is housed in a replica of the original jacket featuring a artwork by Sourdeval and includes a photo postcard featuring lyrics and notes. In Spring 1985 the group went back into the studio to record a new batch of songs. 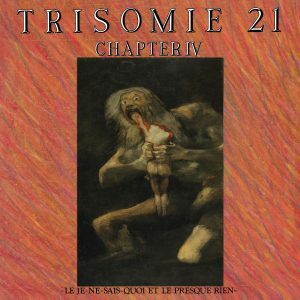 Trisomie 21’s notoriety had increased following two concerts in Belgium and the Brussels recording label Play It Again Sam decided to sign them. In September 1985 the 5-song mini-LP ‘Wait & Dance’ was released by PIAS sub-label Scarface. It contained the band’s first female guest vocals on two of the tracks. Sadly some of the songs had phase related problems and caused partial cancelation playing back monophonically, so the band remixed the songs and reissued them on CD only in 1987. We have added the 5 remixes as bonus tracks here presented for the first time ever on vinyl. All songs have been remastered for vinyl by George Horn at Fantasy Studios in Berkeley. The LP is housed in a replica of the original jacker featuring a artwork by Sourdeval and includes a photo postcard featuring lyrics and notes. 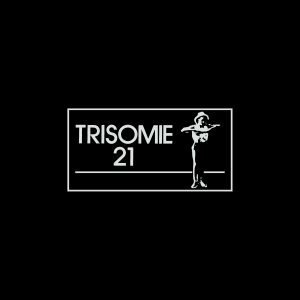 Dark Entries will reissue the first four full-lengths from seminal French coldwave group, Trisomie 21. Originally released by Stechak/PIAS between 1983-1987, these releases will see their first vinyl appearance in over 30 years in a deluxe edition limited boxed set. Remastered by George Horn at Fantasy Studios. We are now selling limited double sided screen posters made especially for this event by Gwenael Rattke on our webshop as well as original Fox Studio T-shirts from 1988. 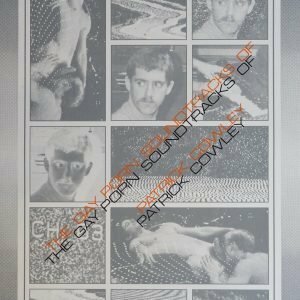 Limited edition hand-screened double sided poster of Patrick Cowley made by Gwenael Rattke for the Goin' Home event. Measures 19.5"x27.5". Mailed in a heavy duty cardboard tube 4"x24". Vintage T-shirts circa 1988 from Fox Studio archives featuring neon pink logo on heather grey cotton Fruit of the Loom brand. Size Large only.